The island of Helgoland has long been a bastion of marine biology in Europe, producing innovative and ground-breaking research. 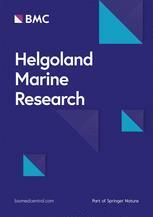 Helgoland Marine Research applies this reputation for excellence to publish the highest quality papers in marine and brackish water ecosystems across the world. Helgoland welcomes papers that focus regionally, with implications on the global scale and contributions that describe species interactions and how they drive marine ecosystems. The journal is supported by the Alfred Wegener Institute, Helmholtz Centre for Polar and Marine Research so author’s do not have to pay an Article-Processing Charge.